Having won more than three dozen titles, Partizan Belgrade are one of the two giants of Serbian football, offering every season two of Europe's (more like the whole planet's) “hottest” derbies against city rivals Red Star Belgrade. The “Black-Whites” were big in former Yugoslavia times as well, but it's mostly after the dissolution of the no longer existent Balkan country that they have dominated the Serbian football scene. Fudbalski Klub Partizan (Фудбалски Клуб Партизан, in Cyrillic and referred to as Partizan Belgrade FC in English), were founded by young officers of the Yugoslav People's Army in October 1945, a few months after the end of World War II. “Partisans” is how members of the communist military formation who fought against fascism were called, and since the club were directly associated with the army, the choice of this name felt totally appropriate. Less than two years after they were founded, the team celebrated their first titles, winning the double (Championship and Cup) in 1947. They finished top in 1949 as well, being the strongest team the first years of the so-called Yugoslav First League, the country's top flight, consisting of teams from Serbia, Croatia, Slovenia, Bosnia and Herzegovina, Montenegro, and Skopje. The fifties passed without a single Championship title, but the club won Yugoslavia's Cup three times. At international level, a 3-0 win over Real Madrid in January 1956 was the club's highlight. 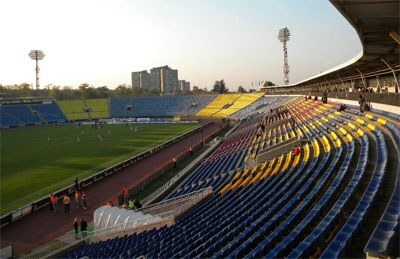 It was the return leg of a European Cup quarterfinal, Partizan had lost 4-0 in Madrid, so they didn't qualify for the semifinals, but that result, combined with the excellent displays against Sporting Lisbon in the first round of the competition, earned the club a lot of respect outside Yugoslavia's borders. The sixties were Partizan's best decade in Yugoslav times, winning the Championship title four times (three in a row), and reaching the European Cup final in 1966, eliminating Nantes, Werder Bremen, Sparta Prague, and Manchester United. In the final at Heysel Stadium, in Brussels, the Belgrade team took the lead 10 minutes into the second half, but Real Madrid answered with two goals. Even so, Partizan became the first Yugoslav, Balkan, and generally eastern European team to reach the final of a major UEFA competition, a source of pride for the Serbian side. Partizan won the Championship twice in the seventies and three more times in the eighties, but it was after the dissolution of former Yugoslavia that they really took the reigns domestically, winning the title eight times between 1993 and 2005, in what used to be the Serbia and Montenegro First League, and, even more impressively, six times in a row, starting in 2008, in the newly – back then – established Serbian SuperLiga. Internationally, the team never came close to repeating the success of 1966 (they did become the first Serbian team to participate in the Champions League group stage though), not because they lacked the talent, but because starting in the late sixties they have been unable and/or unwilling to keep their top players for more than a couple of seasons. There are numerous examples of top players who started their professional career at Partizan, only to depart the club as soon as the “right” offer from abroad came. It's little known that Slovenian star Zlatko Zahovič, for example, made his first professional steps at Partizan in the late eighties/early nineties, or, much more recently, Montenegrin Stevan Jovetic played his first two professional seasons wearing the black and white jersey, before moving to Italy, England, Spain. In all fairness, it wasn't always the greediness of presidents or the will of the players themselves that pushed Partizan young stars abroad. There were troubled times nationwide, mostly the nineties, a bleak decade for Belgrade and the whole of former Yugoslavia, during which, selling a player or two every summer was a matter of survival for Partizan. Attacking midfielder Saša Ilić has worn Partizan's jersey more times than any other player. According to the club's official website, he has more than 800 appearances in black and white, even though the official matches are slightly more than 550. Stjepan Bobek joined Partizan at the age of 21, in 1945, right after the club were founded, and the next 14 years he scored a total of 425 goals, a record that is yet to be broken, and most probably never will be, not only because the sport is played in a very different way these days, but also because it looks practically impossible to see a top player stay at Partizan for more or less his entire professional football life. The “Black-Whites” (who actually spent some years dressed in blue and red, before switching to their now characteristic black and white in the mid/late fifties) have been playing at the same place since they were founded. The JNA Stadium (Jugoslovenske Narodne Armije, Yugoslav National Army), as was known for almost 40 years, was built in 1951 at the same site were the BSK Stadium existed before. Today's Partizan Stadium, “The Temple of Football” as the team's supporters call it, is not the most modern stadium someone could find in Europe, but it definitely oozes with history. Partizan's logo includes the name of the club in both Latin and Cyrillic characters, a red star that connects today's logo with the first ever the team had, and two stars that stand for the more than 20 Championship titles the club have won. Partizan's first logo (on the right) was a blue circle with a red star and the letters JA (standing for Jugoslovenske Armije, Yugoslav Army) inside the star, in times when the team used to play in blue and red.